2nd Floor Rear is pleased to announce two special project locations for the 2015 edition of the festival: Corner, a storefront project space located at 2912 N. Milwaukee Ave., and the Whistler Storefront Gallery, located at 2421 N. Milwaukee Ave. Corner is a storefront project space run by Avondale artist Lynn Basa. 2nd Floor Rear and Corner currently seek proposals for an installation that will remain in the storefront gallery for the entire month of February, with a live, participatory component to take place in or around the space for any length of time during 2nd Floor Rear 2015 (Feb. 7-8). 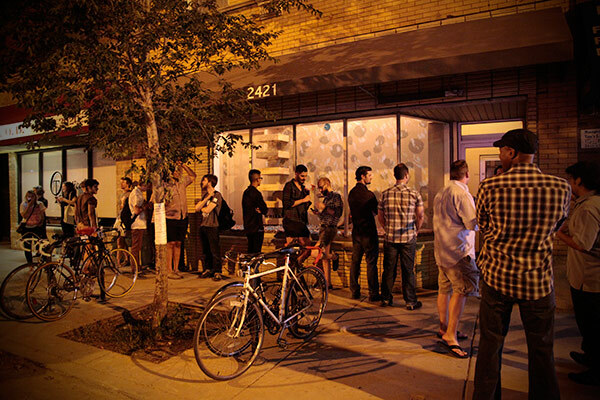 Corner is a white-walled gallery space with large, street-facing windows. Download PDF with complete specs here. The proposed installation should address the entire space and be visible from the street. In addition to an installation, the proposed project should include a live participatory component. This must take place in or around the gallery space sometime during 2nd Floor Rear 2015 (Feb. 7-8). Ideally, the participatory component will draw locals to the space during the festival. All types of work will be reviewed, but preference will be given to projects with participatory components that incorporate storytelling, food, or gatherings, and that engage 2nd Floor Rear 2015’s curatorial premise. If selected, the installation component of the proposed project will remain in the gallery space for the entire month of February. The proposer will work closely with Lynn Basa to ensure successful execution of the installation and participatory component. The artist(s) must be ready to install by the last week of January. Proposals by groups and individuals will be considered. Examples of previous work- link to an online portfolio preferable. Alternately, attachments of no more than 5 examples (tif, jpeg, psd, pdf) will be accepted. The Whistler is a bar, gallery, record label, and venue that hosts live music and DJs seven nights a week. The Whistler Storefront Gallery showcases a new and unique art installation every other month, with a focus on three-dimensional work by local artists. 2nd Floor Rear and The Whistler currently seek proposals for an installation that will remain in the storefront gallery for the months of January and February, with a reception to take place on Sunday, February 8, as part of 2nd Floor Rear 2015’s programming. The window is approximately 12’ wide x 6’ tall, with an enclosed space roughly 2.5’ deep x 13’ wide x 10’ tall. The space is equipped with one, 15A circuit, and two dimmable standard overhead bulb fixtures. Work of all types will be reviewed, however preference will be given to installation and 3D works that utilize the entire space, and relate to 2nd Floor Rear 2015’s curatorial premise. Please refer to the “Gallery” section of the whistlerchicago.com website for outside views of the space. In addition to, or in place of, a reception, the artist may elect to incorporate performance or some other live presentation during the festival, Sat-Sun Feb. 7-8. Any additional live component may occur in or around The Whistler, but may not interfere with The Whistler’s hours of operation or regularly scheduled Saturday night programming. The Whistler will award a $150 stipend to the selected proposer. An area on The Whistler’s website will be provided for artist bio and contact information. Time allotted for installation of work is 2 days. Time allotted for de-installation is 1 day. The artist must be ready to install the first week of January. Questions? Comments? Check out our FAQ page, or email itsaponyprojects@gmail.com.